Hi all! Today’s review is gonna be a little different from the usual. 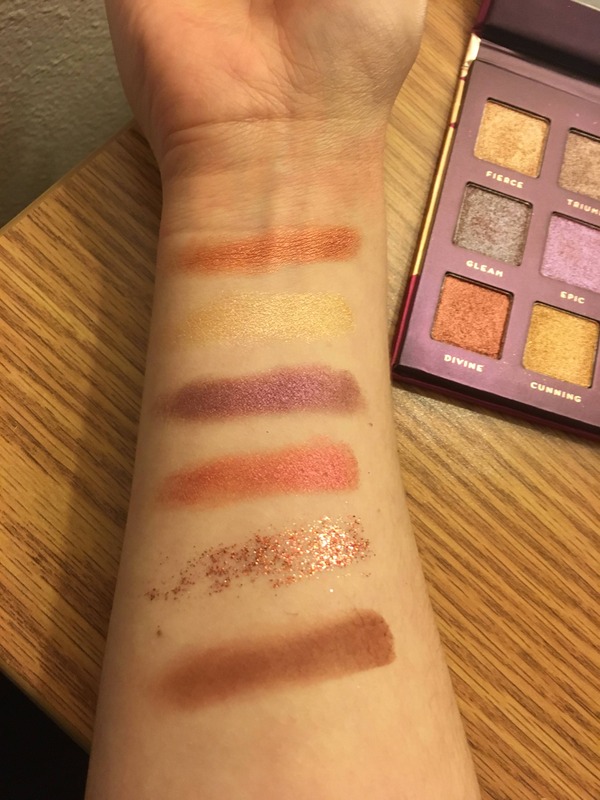 For a while now, I’ve been lusting after the Huda Beauty Desert Dusk palette, but I couldn’t justify that price tag. 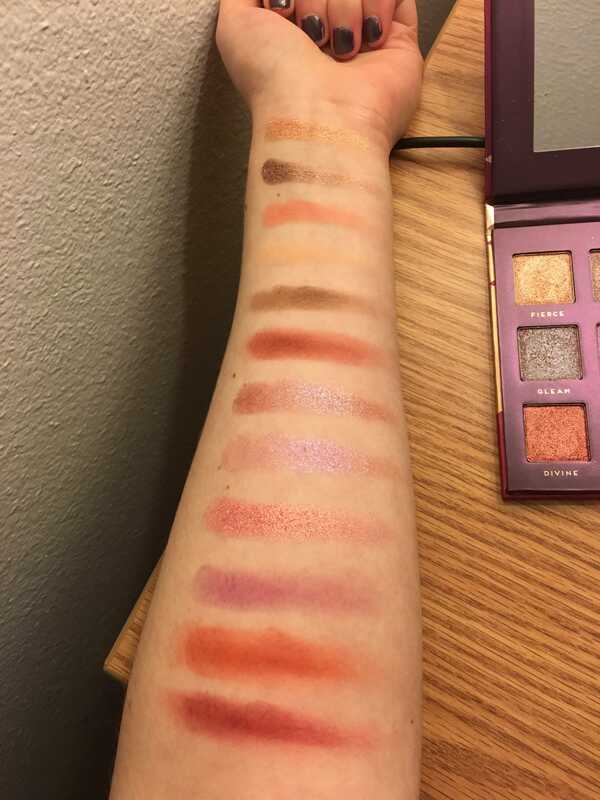 So when I saw that there was a full palette dupe by Bad Habit Beauty, I got really excited. I was a bit skeptical, however, due to the price tag, but I figured that since it was so cheap, it couldn’t hurt to check it out. Bad Habit Beauty is an LA based, cruelty free company that dupes several other popular eyeshadow palettes, such as ABH Subculture and UD Naked Heat. Their palettes can be found on Shop Hush, but I got mine on r/Makeup Exchange. 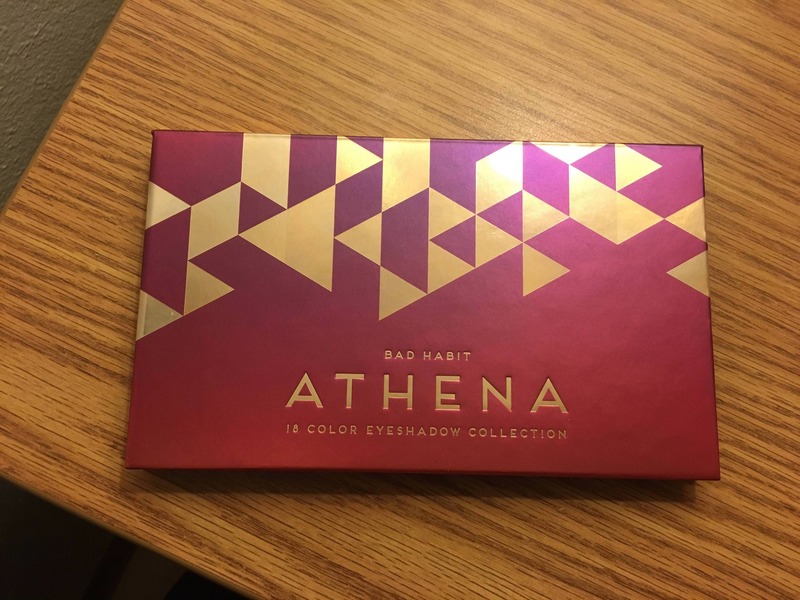 The Athena Palette by Bad Habit Beauty comes with 18 shades: 8 mattes, 7 shimmers, 2 duochrome toppers, and 1 pressed glitter shade. The ingredients are on their website. The packaging is really nice and quite sturdy; it definitely doesn’t feel super cheap. All of the swatches in my post are done with fingers and no primer. My skintone is about N10. 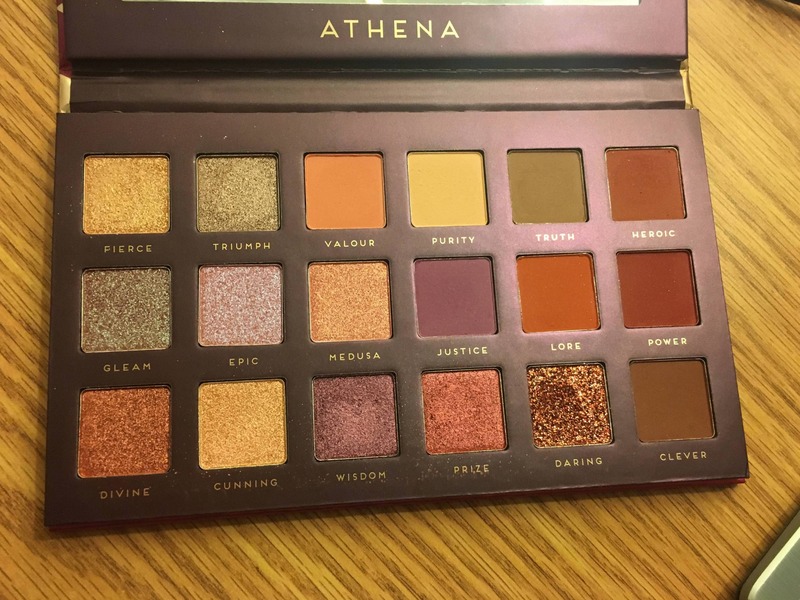 Now, I don’t have the Desert Dusk palette to compare it to, but I can talk about the quality of the Athena palette by itself. Honestly, I’m really impressed. The mattes have a bit of kickback and they can be a tad chalky, but they’re surprisingly pigmented! The shimmers are gorgeous; very metallic and vibrant. The toppers are sheer, but that’s to be expected. They look a bit similar to me as well, but I don’t mind that too much. The glitter shade is hard to apply without glitter adhesive, and I’m not 100% sure if it’s eyesafe. But I didn’t buy the palette for the glitter, so I’m not upset about that. If I had to compare this formula to another brand, I’d probably say that it’s closest to KVD. My biggest gripe about the palette is that there isn’t a dupe for the Huda shade Twilight in it, but I think I have another shadow in my collection that’s similar to Twilight (UD Tonic). Now, onto the dupes! As you can see, some of the shades are reminiscent of the ABH Modern Renaissance palette, but none of them are dead-on dupes. The closest dupes I could find in my collection are Divine and ColourPop White Rabbit, and Medusa and ColourPop Come and Get It. From top: Truth, ABH Warm Taupe. Heroic, ABH Realgar. ABH Red Ochre, Power, ABH Venetian Red. Clever, ABH Cyprus Umber. From top: ColourPop Static, Wisdom, Stila Pigalle. Epic, ColourPop Skydancer, UD Tonic. Divine, ColourPop White Rabbit. From top: Valour, ColourPop Flutterbye. Medusa, ColourPop Come and Get It. Cunning, ABH Primavera, Fierce. Overall, I’m really impressed with this palette, especially for the price point. It satisfies my desire for Desert Dusk without breaking the bank and some of the shades are really stunning. I particularly like Medusa, Divine, Wisdom, and Prize. During this past Black Friday, I finally took the plunge and bought an item that I have been eyeing for a while: a Black Moon Cosmetics liquid lipstick. Black Moon Cosmetics is an indie brand that makes liquid lipsticks, liquid eyeshadows, false eyelashes, and more. They’re a cruelty free and vegan brand with a cool gothic kind of aesthetic, as evidenced by the packaging and the shade names. I absolutely adore dark red lipsticks, so when they came out with the shade Mortis, it immediately went on my wishlist. Mortis is described as “A hauntingly beautiful deep red with an orange base that is just stunning on all skin tones! ” and “The perfect shade of blood.” The name is very fitting, since Mortis is Latin for “death”. Like all of the liquid lipsticks, Mortis retails for $18 US. The packaging is really nice. The tube feels sturdy and the logo and ombre color that matches the lipstick is aesthetically pleasing. I only wish that the shade was written on the tube somewhere. Formula-wise, Mortis is right in the middle between creamy and liquidy. Because of that, I feel like it’s less drying that other liquid lipstick formulas. It also has a nice, sweet vanilla cupcake kind of scent to it. The applicator is a flat doe-foot; I prefer a traditional doe-foot applicator, but that’s just me. This was a quick swatch without lip liner. The shade is absolutely gorgeous; it really does look like freshly spilled blood. It doesn’t have that rusty, brown undertone, but I’m not mad about that. It’s honestly the perfect red for my skintone (N10). It applied smoothly and opaquely and I feel like it layers well too. Lasting power was good; it stays in place when drinking, and only comes off a little bit in the middle when eating. I imagine that greasy foods would do more damage though. I also love that it isn’t overly drying compared to other liquid lipsticks. Obviously, it won’t be as hydrating as a bullet lipstick, but as far as liquid lipsticks go, this is one of the more comfortable ones. Blue eyeshadow doesn’t really go with the look, but c’est la vie. As you can probably tell, I really like this lipstick. The color is gorgeous, it’s not overly drying, and it lasts well. Plus, I love the company’s aesthetic and the fact that they’re cruelty free! If you’re in the market for a new liquid lipstick, perhaps in a more unconventional shade, I highly suggest checking out Black Moon Cosmetics! Today I’m switching it up and talking about another indie makeup brand: Detrivore Cosmetics. 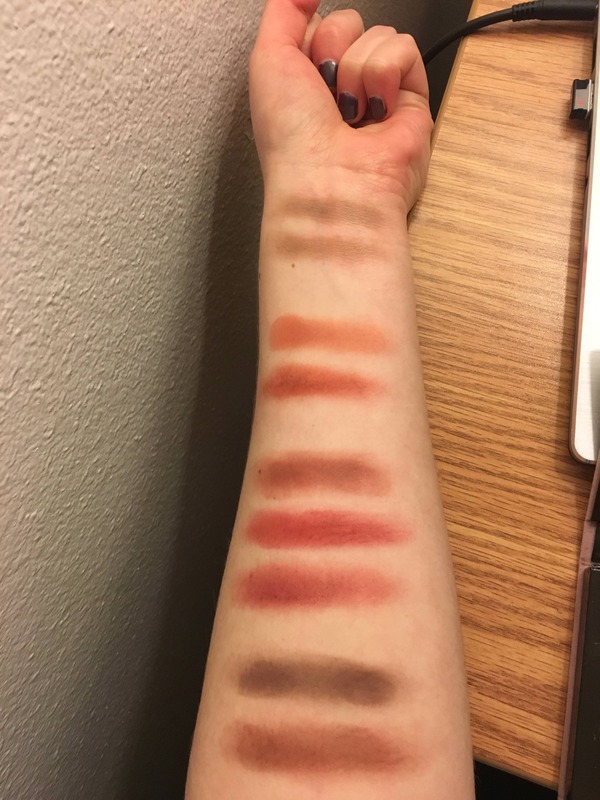 Detrivore makes blushes eyeshadows, and they’ve become quite famous for their matte shades. The company is currently being run by the folks of Shiro Cosmetics, and the Shiro website is where you can purchase them. I picked up samples of a few shades from their fall collection “Beware the Autumn People”, which is based on the book “Something Wicked This Way Comes” by Ray Bradbury. That book happens to be a favorite of mine, and most of the shadows are warm-toned, so this was a match made in heaven for me. Samples are $1 US, and a full sized jar is $6.50 US. All of the eyeshadows are loose powders, and all shades in this particular collection are vegan! 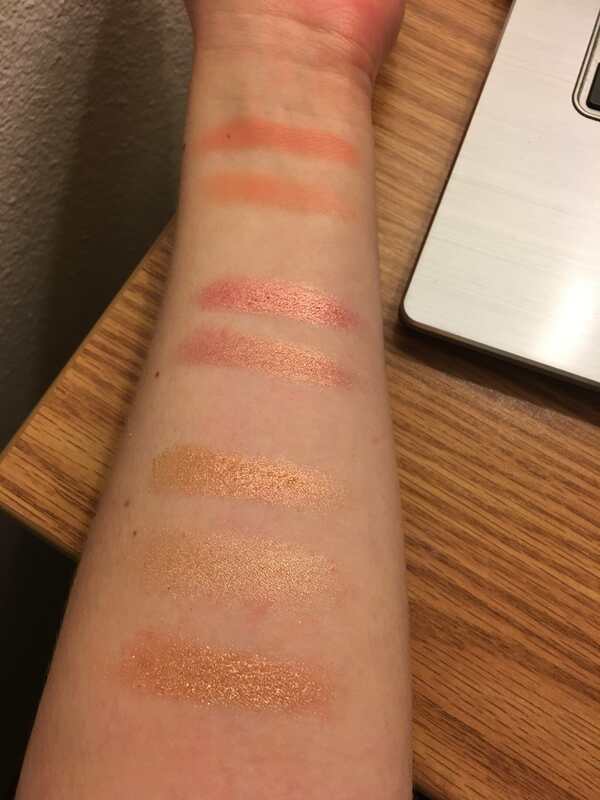 I ordered the shades Burn Yourself at Both Ends, Carousel Calliope, and Richly Treasured Pockets, and I got Comparing Life to Libraries as a free sample. All swatches are finger swatches over Milani eyeshadow primer. Left is without flash, right is with flash. From top to bottom: Carousel Calliope, Burn Yourself at Both Ends, Richly Treasured Pockets, Comparing Life to Libraries. I want to start by saying that none of these photos do the shadows justice; they’re much more saturated in real life. This shade is very true to its description, and it applies smoothly, with lots of pigment on one finger swipe. It’s a perfect shadow for a “one and done” eye look. This color is definitely more of an orange-y copper than a gold or red copper. It’s kind of like the lovechild of Carousel Calliope and Richly Treasured Pockets. It’s not as pigmented as Carousel Calliope, but it’s still pretty pigmented and it applies well. I feel like this shade is one of those classic “true gold” kind of shades. It’s not too yellow or too orange; it’s just gold. It’s a bit sheerer than I was expecting, but I really love the color. This is sort of a weird shade because it the more your blend it in, the darker it gets, and it makes the shade kind of patchy looking. You can see that in the swatches, how the middle looks darker than the edges. I’m not really a fan of that because it makes it hard to get even for an eye look. That being said, it looks gorgeous with the flash because you can see all of the sparkles in the color. It’s probably my least favorite of the bunch though, so I’m glad it was the freebie. All in all, I’m quite pleased with my little set of shadows. My favorite is probably Carousel Calliope, followed by Burn Yourself at Both Ends. The formula is smooth and not chalky, and the colors are overall nicely pigmented. I’d definitely be open to trying some more Detrivore shadows in the future, especially their matte shades! For many international indie lovers, Femme Fatale is their one-stop shop for indie perfume and makeup. While they sell numerous indie brands, they also have their own cosmetics brand, and they are known for their eyeshadows. I’m a sucker for duochrome, and I was so excited when a friend sent me a bunch of Femme Fatale samples. Will they live up to the hype? The eyeshadows can be purchased on Femme Fatale’s website. From top: Alpine Skies, Animal-Shaped Jellies, and Candied Apple. Swatched over Urban Decay Primer Potion. A super pale taupe with cool tones and prominent turquoise shimmer. Magical, ethereal cool toned sparkle. It reminds me a bit of NYX Glass Slipper eyeshadow, but this one has a stronger shift and leans more blue than green. I love it. A brilliant mid-tone pink that leans warm, and golden shimmer. This one is BRIGHT. Like neon pink bright. It has a very subtle gold shimmer in it, but on the eyes, it reads as just hot pink with shimmer; the gold is hard to pick up on. A pale redwood pink with a green duochrome. Probably the most famous of all Femme Fatale eyeshadows. This one is a major shifter. In the swatch, you get this reddish brown color, but on the eyes, its more of a light greenish color with a pinky red duochrome. Its surprisingly subtle, but quite striking. From top: Cheap Tricks, Clockwork Train, Land of Tea Parties. Swatched over Urban Decay Primer Potion. A vibrant mid-tone pink with shiny green-gold sheen. If you think this looks similar to Animal-Shaped Jellies, you would be right. They are almost identical, but I feel like this one has a stronger gold shift to it. Because I love any and all duochromes, I prefer this to Animal-Shaped Jellies. It’s so fun and pretty! A warm puce pink with bold golden overlay. This is easily one of my favorites of the bunch. The description is true to the color and it’s subtle but gorgeous. It’s not quite a rose gold, but its close. A soft ruddy pinkish-beige with blue glow. This one shows up very lavender on me. I’d call it more of a “soft beige with a strong lavender shift”. Despite not really matching the description, I really like it. From top: Mister Whiskers, Puzzle, The Wayward Prince. Swatched over Urban Decay Primer Potion. A grey-toned mauve purple with strong golden shine. Sometimes you come across a shadow so magical that you just have to stare at it. This is one of those. It’s so insanely pretty and pigmented, but its still really wearable in my opinion. It’s sort of like My Pretty Zombie Anthrax, but it has a gold shift instead of a green one and the purple is more mauve-y. I’m in love with it. A concrete grey with copperish-gold overlay. I’m not super impressed with this one compared to the others. It’s a pretty blue-ish grey with copper sparkles. It’s not bad, its just not something I could see myself wearing and I feel like I can find a similar color in other brands. A mauve-rose base with strong bronze-gold overlay. At first, this looks like a boring reddish brown, but once applied, you get this brilliant bronze shine. It’s really nice. I really like Femme Fatale’s formula. It’s very pigmented and it blends well. You could probably get away with not using primer for some of the non-duochromes. Fallout is minimal for all of them, but I noticed that Animal-Shaped Jellies and Cheap Tricks had a bit more than the others. My favorites of the bunch are Alpine Skies, Clockwork Train, Cheap Tricks, and Mister Whiskers. Least favorite is probably Puzzle. I hope you enjoyed my review! What Femme Fatale eyeshadow is your favorite? Comment below! New to the indie makeup scene is Crow and Pebble Cosmetics, a company based in Scotland. The shadows caught my eye when I saw that the debut collection was based around the Four Horsepersons of the Apocalypse from Neil Gaiman and Terry Pratchett’s Good Omens, which is one of my favorite books. That, combined with some lovely interactions with the owner of Crow and Pebble, convinced me to check out some shadows. I purchased the shades Chernobyl Power Station, Petrochemical Sheen, Devotion to Duty and Forest Fire and I received freebies of Lights That May Have Been Stars and the Adam highlighter. The prices are $7.13 US for a full jar, $3,89 US for a half jar and $1.30 for a sample. Shipping was quite quick considering that the company is based in the UK; it arrived 9 days after I got the shipping notification. A deep cranberry with a red shimmer. I’m a girl who loves reddish, warm-toned shadows, so this one was a no-brainer. Shimmery reds are somewhat tricky to find as well. This is a stunning eyeshadow. It’s a rich, shimmery, deeper red, very true to the description. It’s super pigmented and you don’t really need a primer for it. A vibrant, bright orange with gold and violet shimmer. This is another warm toned shadow and another duochrome. I was especially curious about the orange-purple shift, since those colors are the opposite of each other on the color spectrum. It’s impossible to capture on camera, but there is a subtle pinkish-purple duochrome shift that’s gorgeous. The color is a striking bright coppery-orange, but you will need primer and layering to get full pigmentation because it is a bit sheer. A biting, shimmery acid green, practically radioactive. I had to get this one because the color is just so unique. I don’t have anything like this. The description pretty much says it all. The color is extremely vibrant and pigmented. You could get away with not using primer for this one. Despite its brightness, I find it actually really wearable. This one is probably tied for my favorite alongside Devotion to Duty. A deep, warm brown with a bright green duochrome sheen. Duochrome shadows are the main reason I buy indie eyeshadows. I absolutely love them and this one looked super pretty. If you’re familiar with MAC’s blue/green duochrome, Urban Decay’s Lounge, or NYX Voodoo, this is very similar. The shift (which I can’t seem to photograph) is definitely green rather than blue and the pigmentation is good. That being said, you’ll need a primer to really get that beautiful shift. A vibrant sparkly stark white of glittering stars with a red shimmer of something else. This was a freebie, and at first I thought “oh, its just a plain white eyeshadow.” WELL I WAS WRONG. It’s a really shimmery white with reddish-purple sparkles that add a really cool dimension to the shadow. This would make a killer highlight. Adam is not a Horseperson of the Apocalypse; fans of the novel will know that Adam is in fact a sweet kid growing up in the English countryside who also happens to be the Antichrist. This is a highlighter, and is only available when you purchase a certain amount of product. The other shades of the highlighters are Pepper, Brian and Wensleydale. There is no official description of the shade, but I find it to be a soft lavender with gold shimmer. It’s really pretty and sheer, which I like. I’m not a huge fan of the strong highlight, and if you are, Adam is probably not gonna work for you. Overall, I’m very impressed with my order. Chernobyl Power Station and Devotion to Duty are my favorites of the bunch and I’m pleased with the freebies I received as well. I look forward to the next collection! My Pretty Zombie is another indie cosmetic company. They make eyeshadow, blush, setting powder, nail polish and lipstick. Most of their products are known for their interesting or edgy names like Anthrax, Everything Looks Better on a Meat Hook and Grandma Cleavage. I purchased two of their most popular shades in a destash: Brisket and Anthrax. Both are available on the My Pretty Zombie website for $5 each for 5g jar. The top shade is Anthrax and the bottom shade is Brisket. 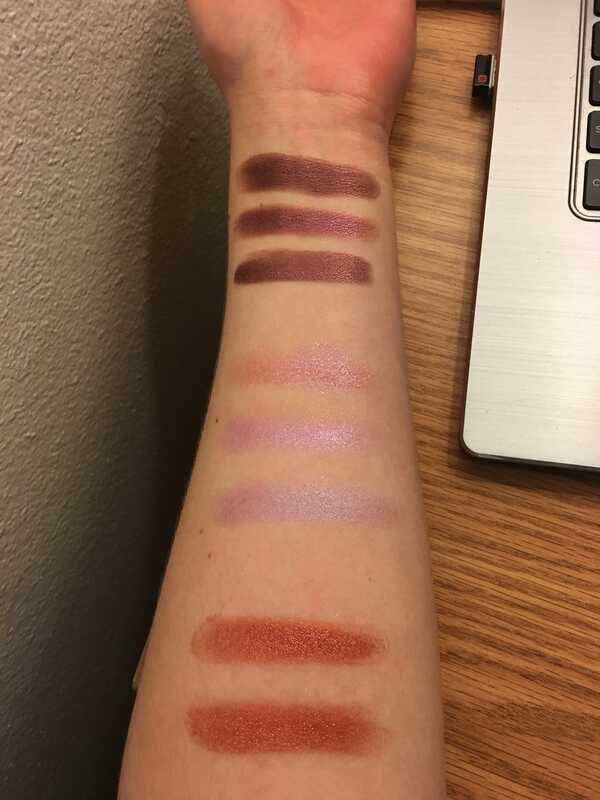 All swatches were done over Urban Decay Primer Potion. Besides being a hilarious answer to the question “what eyeshadow are you wearing?”, Anthrax is a really interesting color because its a purple and green duochrome, which is quite unusual. It’s so gorgeous and I have never seen another eye shadow quite like it. Brisket was recently reformulated, so this is the original formula of Brisket. The color is more gold while the new one is more copper according to the website. I’m honestly freaking out about this color. I really love warm-toned eye looks and its hard to find something more warm than this. It’s so fiery and vibrant. It honestly looks like someone took the Eye of Sauron and made it into an eye shadow. I’m in love. I am extremely impressed with both of these eyeshadows. The colors are spectacular and unique and the formula is really good too. It’s pigmented without having heavy fallout. I look forward to exploring more of My Pretty Zombie’s eyeshadows in the near future. The indie community isn’t just made up of perfume; there are many cosmetic companies as well, and one of the most famous is Shiro Cosmetics. Shiro makes loose eyeshadows, lip gloss, highlighters, blush, and nail polish and all of the collections are themed around a book, TV show or movie. Just a taste: there’s Harry Potter Collection, a Fullmetal Alchemist collection, a Game of Thrones collection and an amazing collection based around Nicolas Cage and different time periods. Those are only the tip of the iceberg. Today I will be reviewing a handful of eyeshadows samples and a lip gloss. Eyeshadow samples are $1 US, a mini jar is $3.75 US and a full jar is $6 US. Lipgloss is $2 US for a sample and $9 US for a full size. Shiro also includes free random eyeshadow samples with every order! From top to bottom: Alkahestry, Day of Reckoning, A Fell Voice on the Air, The Boy Who Lived, Colonel, Have a Biscuit Potter, Lingered in Twilight. All swatches done over Urban Decay Primer Potion. Sheer-ish pale violet with a brilliant blue-sparkle base. Lip-safe! GLITTER BOMB. The color is gorgeous, but because its so glittery it can be difficult to work with. You’ll need a glitter primer/adhesive for this one. Intense, metallic deep burgundy. Lip-safe! I think this one is my favorite of the bunch. The color is magnificent and its very pigmented. It goes on smoothly with minimal fallout. It definitely looks more purple than red on me. Bold iris purple with strong green/aqua shift and golden sparks. Not lip-safe. I’m torn on this one. On one hand, the color is really pretty once you apply it correctly, but on the other hand, its very sheer so it takes a while to get the color to its full potential. I find it more blue than purple as well. Pure smooth charcoal with Gryffindor-worthy sheen: a heart of warm red and bright flecks of gold. Lip-safe! This one is my least favorite. It has a ton of fallout and the color just seems like a dull brown with some sparkles in it. It’s fine for a plain neutral, but I was expecting more. Military blue packed with gold sparkle. Not lip-safe. This one is highly pigmented and the color is true to the description. However, it does have a lot of fallout. Pure metallic emerald, gives an intense depth of color without being too dark in the base. Not lip-safe. THE COLOR. This is one of the prettiest eye shadows I’ve ever seen. It’s a true, Emerald City green. Unfortunately, I find that green eyeshadow looks really weird on my skin tone, but if you love green shadow, you need this in your life. A twilit forest: blackened blue and green tones with slightly metallic shimmer. Not lip-safe. SO PRETTY. The swatch I did doesn’t do this one justice. I find it to be more of a black with green and blue sparkles, but its absolutely stunning. I love using this for a smoky eye look. Very opaque blood-red. Flavored with cheerful fruity cranberry! First off, I had to get this because of the name. I got the full size because I had a feeling I was going to love this and I was right. It looks like straight up blood; the perfect mix of dark red and brown. It’s not sticky and it lasts for a while and leaves a lovely stain behind. All in all, I really like Shiro Cosmetics. They make some really unique eyeshadows and their lipgloss formula is incredible. Their samples are a great way to try out different colors and finishes and the price point is awesome too!